« Real, live brain cramp? So tell me, what does your dream kitchen look like? I bet it has nothing to do with peeling/chipping paint, boring colors or outdated and ugly hardware, does it? Guess what! My dream kitchen didn’t include any of those either, but that was what I had. And after much hinting, whining, and overall complaining about the state of my kitchen, hubby finally caved! It started at a home show…. Notice the worn paint and ugly hardware? 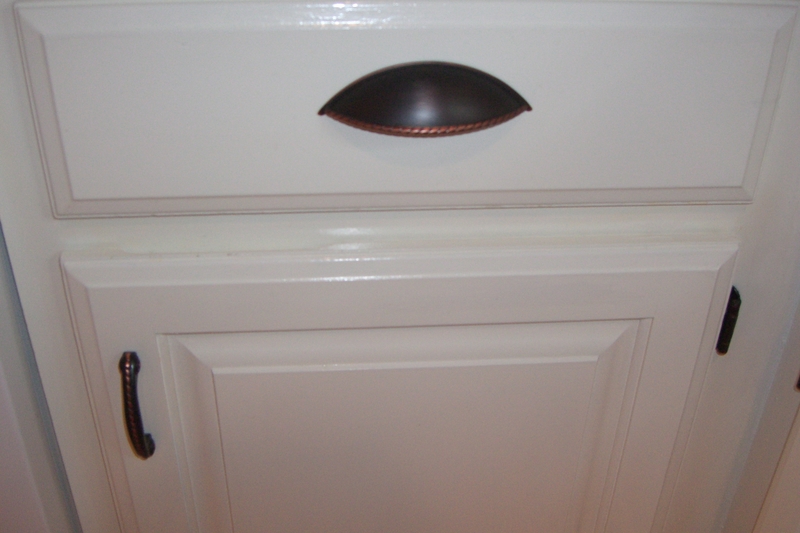 We found a company that refinishes cabinets for much less than it would cost to do what I wanted to do. 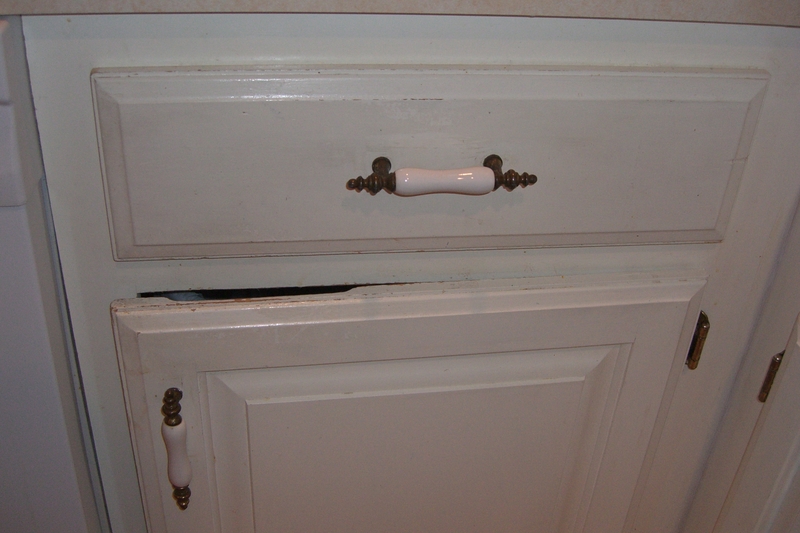 To be honest, I wanted to rip out the cabinets and start all over, but, well, since we are not movie star rich, we had them refinished and repaired. Then installed new hardware, whaddaya think? Now the really BIG part. 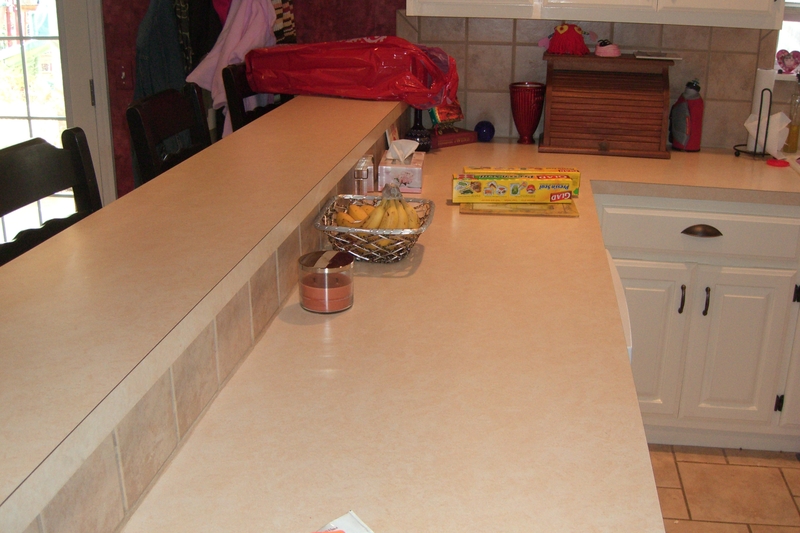 The countertops were a really boring, cream colored laminate. Everything in the kitchen sort of just blended together and was, yawn, dull. My lovely, long counter. We have fantastic parties here! It looks like a completely different place now! And that lonely door I showed you before, w/the peeling paint and bad hardware…. 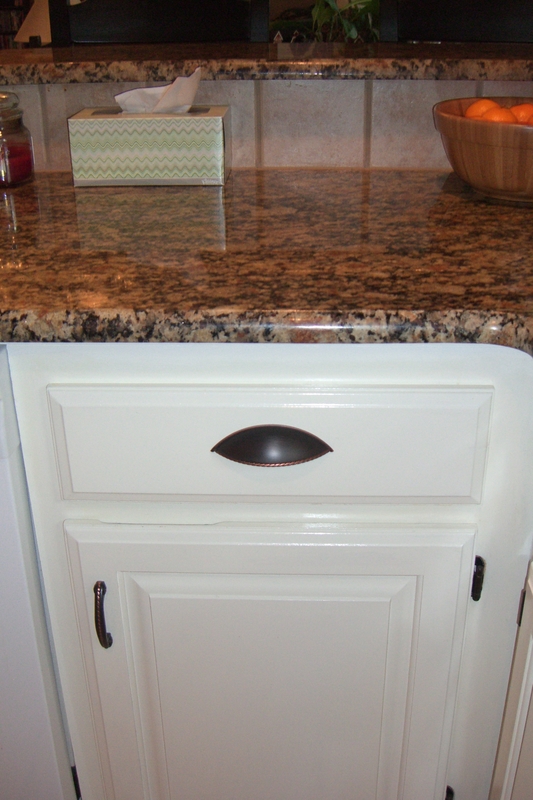 IDK if it comes thru but the colors of the backsplash and hardware are in the granite. So….that was my Christmas present! Lucky I love cooking! I am a happy girl to spend my whole day in there cooking away! And now since it’s crazy cold and snowing outside, I suppose it’s time to get busy! Oh wow, it is a big difference. The before photo at first I was like not bad until I read what you pointed out to. Then I said oh okay, I can understand. Then the result is totally beautiful. 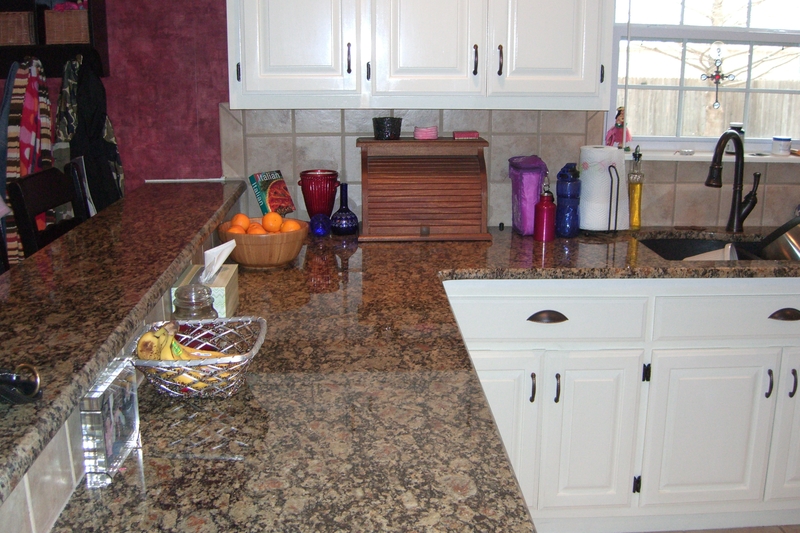 I love marble/granite counter with some design. Beautiful kitchen! Thanks! It is a huge difference! I am very happy with the end result! come on over sometime! We’ll make some cookies or something! Because I would love too! Child yes, I did imagine it. You have more counter space then I have that I sometime have to work on my flat top:( I can imagining the holiday meals can sit out easily until ready to prepare even when you have guest over you kitchen counter top can have everyone meal spread out an each plates waiting for the next entry. You are very lucky! When I have quest here. I am running the dish washer and trying to neatly piles things in the sink and counter to not look like a mess or to fall to the ground. Yes, i am very lucky! The kitchen was one of the things that really sold the house, the white wasteland that it was. 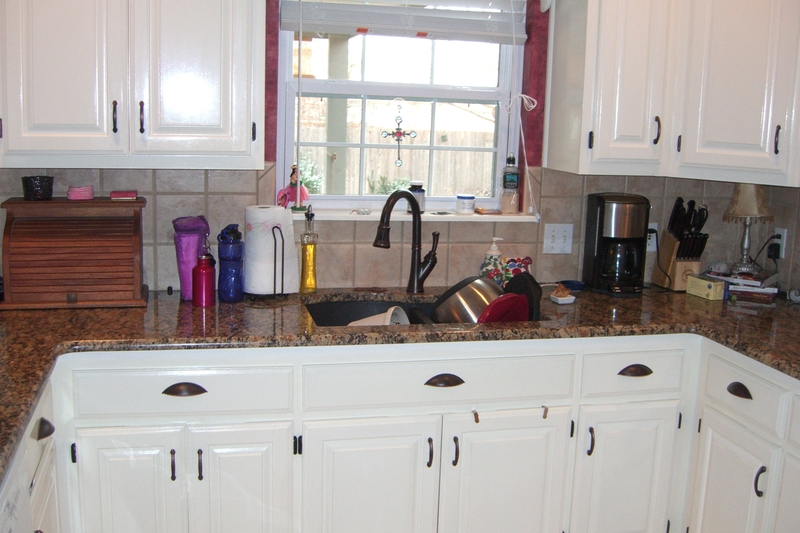 My old kitchen was a galley style kitchen and very cramped. i have heard that kitchens in Germany can be tight, but i have a feeling that doesn’t slow you done one bit! Lol, yes the kitchen are very small here. Well most of them. Also it is rare you rent a apartment or home with a kitchen. You normally have to buy your own kitchen. You the flat or house come with a kitchen you must pay the cost the person bought it for. So the rule here is take your kitchen with you or sell it. 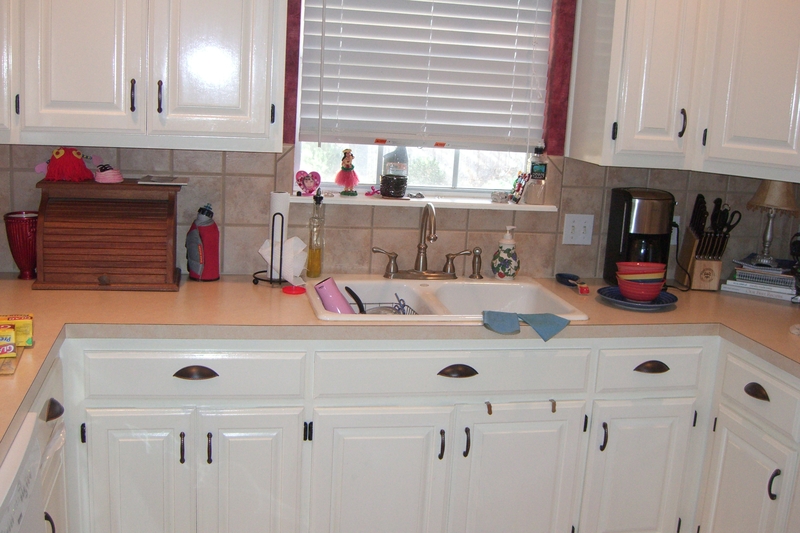 The landlord bought our kitchen because he did not wanted to put the rent down and we are glad he did. Because not every kitchen fit in every house or flat. wow! I had no idea ppl took the whole kitchen with them! I understand the refrigerator, but all of it? wow. I would be glad if my landlord did what yours did too! kitchen appliances are not cheap! So excited for you! Wow! I would LOVE a kitchen like this – someday we plan to sell our current house and buy a fixer-upper and then I shall have a kitchen like this! Thank you! I absolutely love it! I loved the kitchen when we bought our house, but now it’s just wonderful, really makes a big impression!